I always seem to pay a price for my vacations...the nanobattery encyclopedia article lies on my desk unfinished, the scanning electron microscope must be fired back into life, and the garden is speckled with spring weeds. I keep part of my prairie plot unmowed, and rampant self-seeding into the flower beds is the result. But I will procrastinate on it all, for just one more afternoon, to tell you what-I-saw-in-London and savor it again myself. Down a busy street in Richmond, a sign painted on a brick wall beckons with the promise of something special this way. Past the narrow alley the landscape opens up onto the Petersham meadows, and down the lane is a nursery straight out of a Merchant Ivory film set. 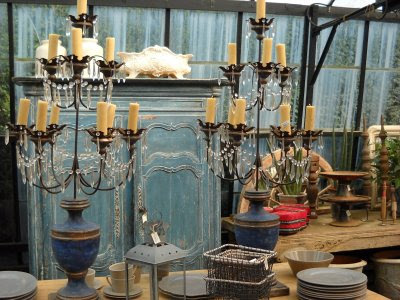 In addition to impossibly beautiful garden ornaments and handmade candles smelling of 'Marie Antoinette's Dreams' there is a restaurant (expensive) where the waitresses wear wellies and a cafe (reasonable) for lunching outside. 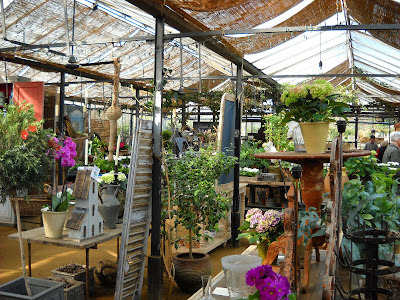 Petersham nurseries is in danger of losing its planning permission due to the increasing vehicle traffic; visit by public transport if you can. Instructions for supporting their application for permanent planning permissions are on their website. 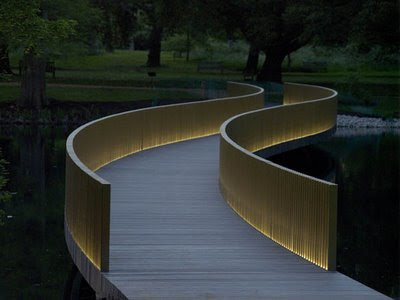 and the new Sackler bridge by John Pawson with its sublime curve: this is minimalism I can believe in. More about the rest of my trip later; for now it is on to an interlude of weeding and an evening of writing about nanobatteries. What wonderful finds! It all looks lovely! I love the trip, except for the treetop walkway--just the thought made me dizzy! What's the bridge made of? In one photo it appears like plastic wood, in the other, seems to have the subtle gray of ages teak or cedar? You sure packed a lot in - those photos are very good. I haven't been to Richmond for a few years - always a fascinating place. How depressing. 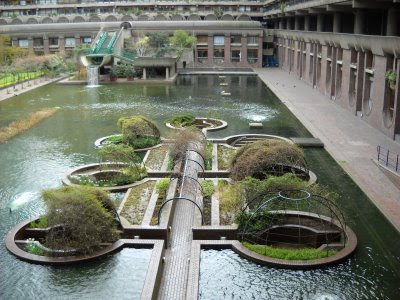 I spent 10 years in London and didn't see half this stuff! Glad you enjoyed London. 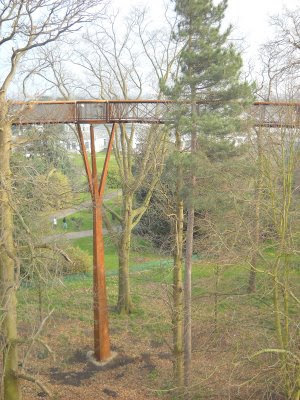 The treetop walkway has great views out over Kew, as well as giving you that Calvino 'Baron in the Trees' feeling... 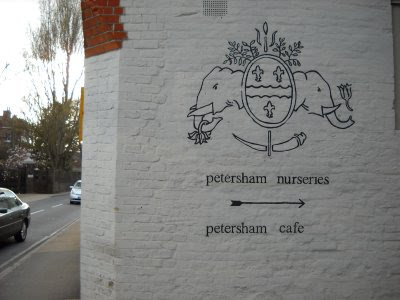 Didn't realise Petersham is under threat - haven't been for ages but agree it's a special place (especially the food done by celeb chef Skye Gingell). Oh, I have not been to London yet and really want to go. Your trip description and photographs make it even more desirable. It was worth the weeds continuing to grow another day. Thanks for the bridge images: stunning. Since I am unlikely to get to Petersham, I bought Skye's cookbook so I can recreate a bit of it in my garden. nanobatteries? 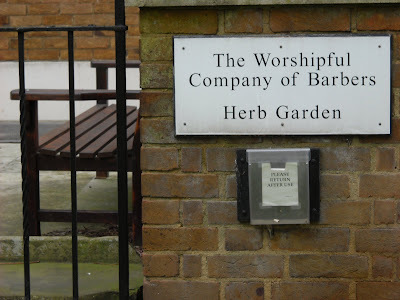 so its not all gardening then. the treetop walk looks like some experience. 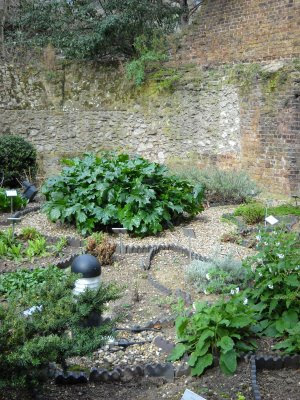 how far does it extend through the gardens? 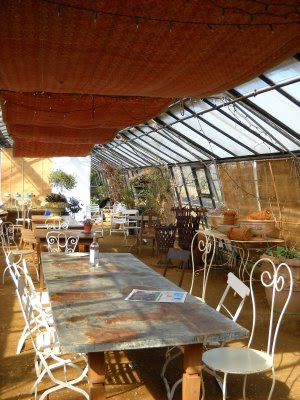 I went to the Petersham nurseries restaurant a few days ago - a wonderful experience (see my blogpost of last Sunday). 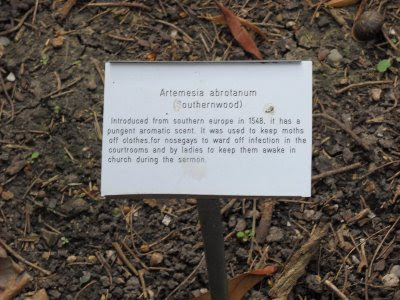 On saturday I'm hoping to have a day at Kew (one of my favourite places in the world). I haven't been up the tree walkway yet - I suffer from vertigo, but I hope my trembling legs will make it. I've just found your blog - love it! 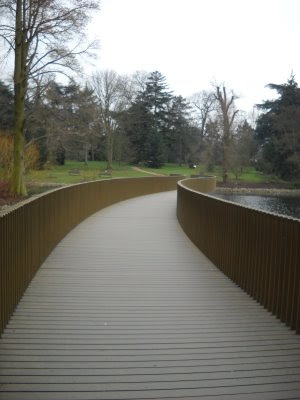 Your London trip looks like it was great - I love the treetop walk photo! Scrolling down I was delighted to see the Quincunx book! I read that many years ago while at art college - there was an edition with illustrations by Paul Nash, who was one of my favourite artists. I found the book fascinating. It would be wonderful if someone could create a walkway like that through some of the California redwoods. Would be a bit more interesting than the drive-thru trees.